And so we come at last to vowels, the final stop on this journey we call Phonology 101. So far, we’ve talked about the vocal tract (here), phonemes (here), and consonants (here). There’s also a post on the International Phonetic Alphabet (here). As far as human speech sounds go, I feel like consonants are pretty straightforward. Sure, some are harder to produce than others, but you can point to a relatively clear place of articulation that’s easy to feel when you produce the sound yourself. When you produce [m], your lips are together. When you produce [t], your tongue touches right behind your teeth. Vowels are…squishier. Let’s start with the easy part: all vowels are, by nature, voiced.1 Like consonants, vowels can be either oral or nasal, depending on whether the velum is raised or lowered (see if you can tell the difference between the vowels in mat /mæt/ and man /mæn/). Vowels can also be rounded or unrounded; this describes the shape of the lips during production. Now, we need one more thing, one more feature, something similar to the consonants’ place of articulation, to distinguish each vowel from all the others. That magic feature is the position of the tongue within the vowel space. Well, it’s actually two features: height (or closeness, as you’ll see on the IPA chart) and backness. IPA Chart, http://www.internationalphoneticassociation.org/content/ipa-chart, available under a Creative Commons Attribution-Sharealike 3.0 Unported License. Copyright © 2015 International Phonetic Association. Vowel height is kind of what it sounds like: how high (close) or low (open) in the mouth the tongue is. Backness refers to which part of the tongue is providing the pertinent interaction with the height variable—the back (closest to the throat), front, or center. When talking about vowels, it’s good to keep in mind that as far as words meaning “middle” are concerned, “central” refers to the horizontal feature and “mid” refers to the vertical. So, why do I say vowels are kind of squishy? In consonants, the tongue hits specific points along the roof of the mouth. In vowels, the tongue is interacting with empty air—a much less precise target to hit thousands and millions of times while speaking. In fact, phoneticians call our phonemes target vowels. But what’s all this talk without some examples? In cheese /t͡ʃiːz/, we find the high, front, unrounded vowel. The front of the tongue is high in the mouth, and the lips, rather than pursed, are pulled back into something resembling a smile (as many a subject of a painfully posed photograph can attest). In choose /t͡ʃuːz/, the tongue is again high, but this vowel is back and rounded. The vowel in chess /t͡ʃɛs/ is low-mid front unrounded. The vowel in Chaz /t͡ʃæz/ is low front unrounded. The first vowel in Chaucer /t͡ʃɔːsəɹ/ is low-mid back unrounded. I’d like to point out a couple funny things you may have noticed in my phonemic transcriptions of these words. First, I used /i/ to represent what native English speakers commonly think of as the E sound. The symbols used in IPA are a mix of letters and specialized characters. In the case of the vowels, the commonly familiar letters correspond to the so-called Continental vowels, i.e. they represent the sounds they spell in most European languages. English is the misfit here. The spellings we use for vowels are mismatched to the way they’re treated in other languages. There’s a very good reason for this, but that exciting story will have to keep for another day. As for /e/, this is used in IPA for what we English speakers think of as the A sound. Next, the keen-eyed will have noticed that when I transcribed cheese, I didn’t just use /i/. There’s two funny dots after it that look like a colon. This symbol indicates that the vowel is long. American schoolchildren learn that the difference between Pete and pet is that the first has a long E and the second has a short E. This is not what I mean. For a phonologist, that sense of “long” and “short” is erroneous (and in fact, those two words have completely different vowels). Rather, this symbol means that the vowel is held for a longer length of time; it indicates duration. In some languages, vowel length is phonemic, i.e. it differentiates one word from another. Heck, it used to be phonemic in English way back in the day. You don’t have to worry about whether your vowels are long or short in Modern English. That’s one of those allophonic2 features that just kind of happens. Last, there’s a second vowel in Chaucer that I haven’t mentioned yet, represented by a flipped-around lowercase E: /ə/. A lot of these symbols I’m using are probably new and unfamiliar, so you may not have noticed it hiding there, but this disoriented little letter is special. It’s name is schwa. It represents a mid central unrounded vowel, which is to say it represents a relaxed, mushy, indiscriminate vowel sound. It’s often found in unstressed syllables, and it can be an allophone of a lot of other vowels when you’re not going out of your way to enunciate every word. It never really satisfies the phonemic requirement of separating one word from another, but it’s an important little sound nonetheless, this lazy vowel. Plus, schwa is fun to say. There are a few more things to bear in mind about vowels. First, very few of the vowels we produce in English are pure, single sounds. Much like the consonantal affricates, sometimes two vowels get produced in such close sequence they act like a single sound. For vowels, these are called diphthongs. You can hear diphthongs in words like chase /t͡ʃeɪs/ and chai /t͡ʃaɪ/ (or the names of the letters A and I). Second, vowels tend to vary a lot more from dialect to dialect than consonants do. You can look at all the varieties of English across the world, from Canada to New Zealand, and draft almost identical lists of consonants for all of them. On the other hand, you don’t have to be a linguist to tell that they all use (sometimes drastically) different sets of vowels. Several times throughout this series, I’ve encouraged you to stop and to try producing some of these sounds. This is especially useful if you’d like to get a handle on vowels. Say some. Just roll sound around in your mouth. Make random, vowel-ish noises. I can give you clinical definitions of consonants. Vowels you’ve got to feel. This is the end of Phonology 101, but if you’ve fallen in love with the science of speech production and sounds the way I have, don’t you fret. Phonology has a starring role in some of the most exciting stories English has to offer, and you can bet we’ll be bringing them your way. For now, you Scots lovers better hold onto your hats. Lisa’s back next week to help us understand some of the differences between English and Scots. 1As a point of curiosity, some languages, like Japanese, occasionally have voiceless vowels in specific contexts. But, this is a rarity. Like how hand sanitizer claims to kill 99.9% of germs. 2I know this is a blog, and we’re kind of asking a lot by asking you to remember all this terminology. Your cheat sheet for phonemes and allophones is right this way. Well, well. Here we are again. Back for more Phonology 101. Today, we’re finally going to start putting names to faces, or, uh, sounds. That’s right, it’s time to talk about consonants! Phones (as we learned to call speech sounds last time—catch up here) can be broadly divided into consonants and vowels.1 As you probably know, words can be divided up into syllables. A quick and dirty way to separate vowels and consonants is that vowels form the nucleus, i.e. the middle, of a syllable, and consonants are the sounds that go around the outside.2 If syllables were sandwiches, consonants would be the bread and condiments and the pickles and the lettuce and all that good stuff you put around the meat, i.e. the vowels. But really, the main distinguishing characteristic of a consonant is that the flow of air through the vocal tract is impeded in some way. The nature of the impediment is called the manner of articulation.3 Together with place of articulation and voicing (which we discussed in part one of Phono 101—here), the manner of articulation is one of the three major defining characteristics of a consonant. Today, I’m going to go over several types of consonants, which will cover the bulk of the chart. 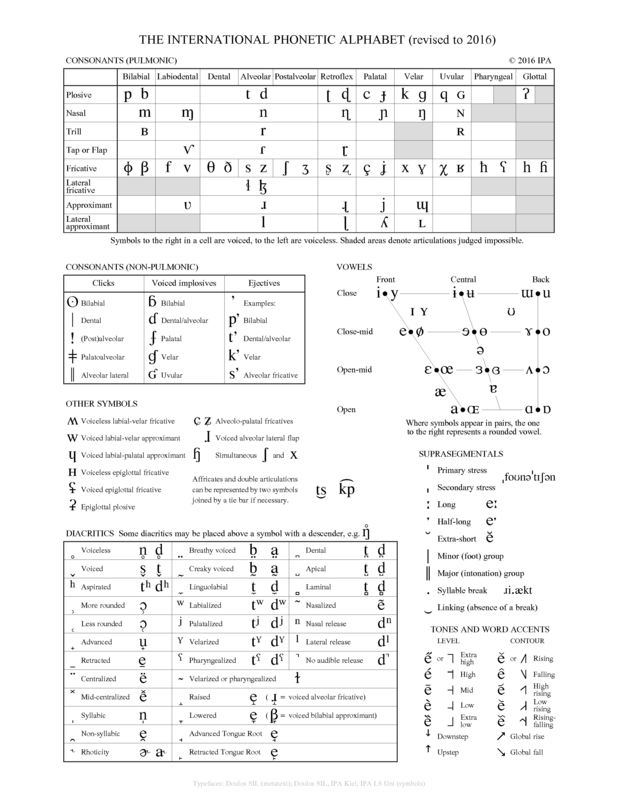 The consonants I won’t cover are trills and taps (which you can see on the chart above), and clicks, implosives, and ejectives (which are listed elsewhere on the complete IPA chart, viewable here). These are much rarer in the world’s languages and, wouldn’t you know it, a bit trickier to grapple with. The sounds I will cover are all present in English, and that’s where I’ll be pulling my examples from. This is not because English is somehow more exemplary than other languages, but I’m writing in English, so I assume you, my trusty reader, have at least some familiarity with its sounds. Another type of consonant is the fricative. Here, the flow of air is highly restricted but not completely cut off. These sounds tend to buzz or hiss, and the name of the game here is friction. Excellent examples are [v] (a voiced labiodental fricative) and [s] (a voiceless alveolar fricative). Fricatives are fun because you can drag them out as long as you want as long as you’ve got enough breath support. Now sometimes, occasionally, when a stop and a fricative really love each other, those two crazy kids get together and form an affricate. An affricate is a stop followed in such close sequence by a fricative, they overlap to create what sounds like one phone. English has a couple of these. The first and last sounds in church (/t͡ʃ/) and judge (/d͡ʒ/) are affricates. There’s some debate over whether affricates should be treated as one sound or as a sequence of two. Stops, fricatives, and affricates can, generally, be either voiced or voiceless. Due to how they’re produced, this isn’t necessarily true for some of the other types of consonants. Some of those perpetually voiced sound are known as approximants. In these sounds, the airway is restricted, but the air passes around the sides of the tongue or passes through the narrowed areas without the friction characteristic of fricatives. This category includes sounds like [l], [ɹ], and [w]. “Approximants” is actually kind of a catch-all term for some of the most complicated consonants to produce, and they can be broken up into several subcategories. We’re not going to dive into those right now; I don’t want to make your head hurt more than I have to. In all of these sounds (stops, fricatives, affricates, and approximants), the air passes through the oral cavity. For some sounds, the velum is lowered, allowing the sound to pass through the nasal cavity, like in [m] and [n]. This one’s easy: these sounds are called nasals. That’s the whole grocery list, so let’s get back to our tenuous sandwich analogy. Some sandwiches/syllables are simple—just two pieces of bread and a slice of roast beef, like cat. Some have mayonnaise and tomatoes and cheese and all sorts of other fixings, like strength (the linguistic term is consonant clusters). Some sandwiches/syllables are open-faced, like do. No matter how you serve it up, put all the ingredients together and you wind up with something delicious. 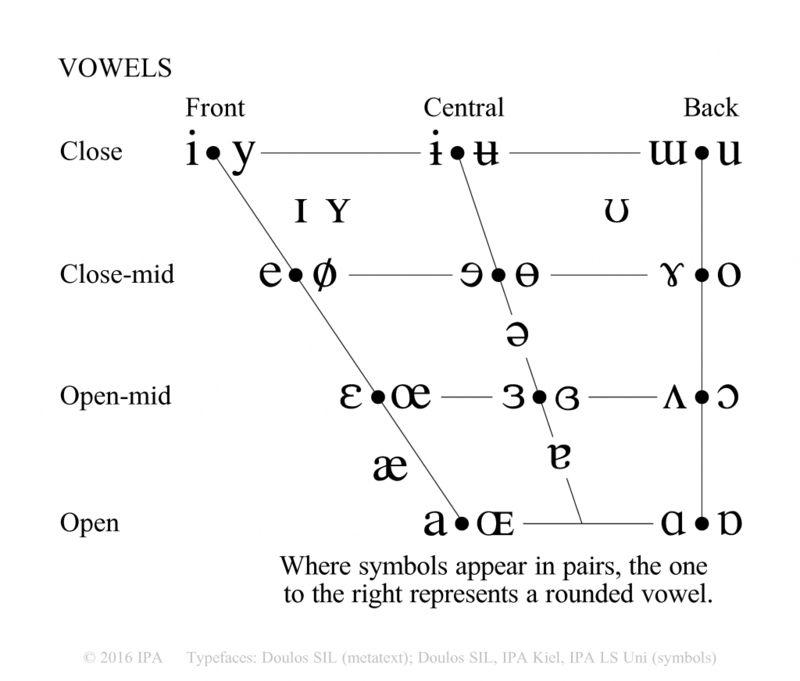 In two weeks, I’ll be back to finish off Phonology 101 with an exploration of that phonemic delicatessen, vowels. Next week, Riccardo will be here to bend your mind on the subject of linguistic prejudice and a little something called phonaesthetics. 1Finally! Something intuitive, am I right? 2There are a couple consonants that occasionally blur this line, but contrary to what you might expect, none of them are represented by the letter Y. 3Technically, vowels also have a manner of articulation, but it’s the same for all vowels. Manner of articulation isn’t really important for vowels, but it’s crucial for consonants. 4Get it? “Spread”? I’m sorry. Welcome back to Phonology 101! Last time, we talked about the vocal tract and two major features of speech sounds, namely place of articulation and voicing (catch up here). Today, we’re going to stop using the word “sound” in favor of some more precise terms: phone, phoneme, and allophone. You may also find it useful to catch up on IPA (here); I’ll be introducing some important notation, and moving forward, I’ll be using IPA more and more. Individual speech sounds are called phones. In talking about speech production, we keep distinguishing between phonetics (the concrete/physical) and phonology (the abstract/mental). Phones exist on the phonetic plane. Our mental representations of the sounds in our language are called phonemes. If your brain was a computer running a language program, phonemes would be all the sound files. As mentioned previously, the International Phonetic Alphabet is the standard for transcribing phones and phonemes. When using IPA, brackets put around the symbols indicate whether phonetic or phonological data is being represented. Phones go in square brackets (e.g. [a]), and phonemes go between slashes (/a/). On both levels, this notation can be used for individual sounds, complete words, or even phrases and longer utterances. Some allophones are pretty obvious to spot, but others are more subtle. In ram [ɹæ̃m] the vowel takes on a nasal quality not present in rat [ɹæt] through the influence of the following nasal consonant /m/. This is how allophones tend to come about. In actual speech, no sound is produced in a vacuum. In the interest of ease of articulation, our mouths carry over features from previous sounds or, as in the case of ram, anticipate upcoming sounds. This process is highly predictable and regular. A phoneme will consistently produce the same allophone in a given environment. Okay, so what? This is all well and good for linguists who just want to Know, but does it have any impact on your life? Well actually, yes. Every language variety has its own phoneme inventory. Phonemes in one language may only be allophones in another (or may be missing entirely). When we pick up a language as children, our boxed set of language features includes a list of sounds we consider phonemes. As we grow up, this internal phoneme inventory solidifies and becomes very hard to alter. This explains why people have an accent when they learn a second language—they’re unconsciously using their native phonemes. Our phoneme inventories don’t just influence the way we pronounce words. They also filter how we process what we hear. In my dialect, I pronounce merry, marry, and Mary the same. In some dialects here in the United States, these words contain three different vowels and therefore have three distinct pronunciations. I’ve studied phonology long enough that I can carefully reproduce these pronunciations (when I remember which vowel goes with which word), but I still can’t hear the different when a native speaker of this dialect produces these words. For me, all these vowels get lumped into the same phoneme, so that’s how I hear them. This isn’t a big deal for a situation like mine, where the phoneme difference is slight and it will be easy for me to figure out what’s being said. The differences between phoneme inventories can get more pronounced4, and interfere more with comprehension, when you’re speaking a second language. For example, in Arabic, [b] and [p] are not distinct phonemes, so it’s hard for a native Arabic speaker to distinguish between English barking and parking. And this is why we’re wading through all this terminology and technical swampland: Language is a real world phenomenon with real world consequences. As in the Arabic example, phonology can have an effect on actual communication, as can morphology, syntax, semantics, and the other basic disciplines of linguistics. Once we’re done laying the groundwork, we can get to the fun stuff (like, what’s up with English spelling? And how do you pronounce GIF?). There will be two more posts in the Phonology 101 series (for now). In two weeks, we’ll get into the nitty-gritty of consonants, and then in March, we’ll go over vowels. Before we get to that, though, Sabina will be back next week to talk about something called the Sapir-Whorf hypothesis and ask the big questions: Does our language influence how we think? 1Giegerich, Heinz J. 1992. English phonology: An introduction. Cambridge: Cambridge University Press. 2An archaic plural of cow. I just really wanted to use it. Like a lot of academics and professionals, we linguists are swimming in a creamy alphabet soup of shorthand jargon and abbreviations. One of our favorites (that is, one of the most used) is IPA. No, we’re not all holed up brewing India pales ales and waiting for the next convention of the International Polka Association (although, some of us might be—I really can’t speak for everyone). To us, IPA stands for the International Phonetic Alphabet. As Lisa explained last week, phonetics and phonology concern themselves with the sounds of speech. 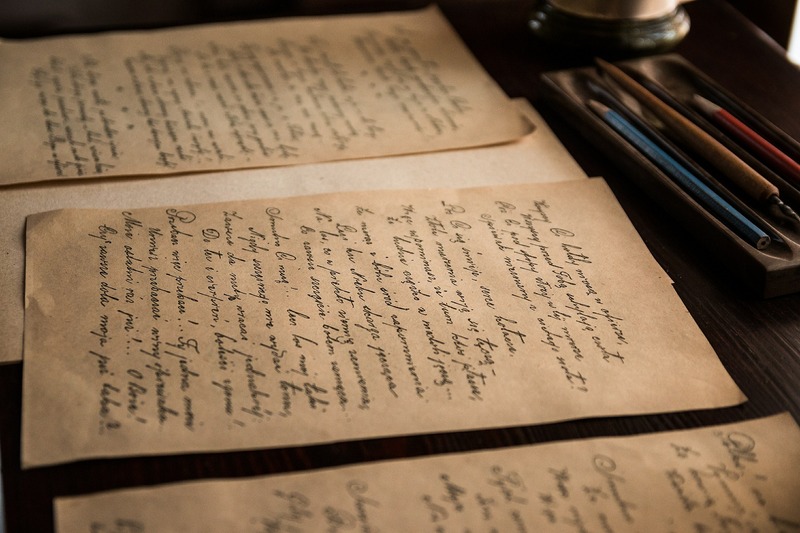 English writing uses 26 letters. So, does English have 26 sounds? Think about the letter A for a minute. It makes different sounds in call and cat and came, but it would be a very odd day of autocorrect indeed before a native English speaker would use anything other than the letter A to spell these words. This certainly isn’t the only letter multitasking its little heart out. Let’s not venture into the world of spelling and orthography just yet (Sabina will get to that in a couple weeks). Today, we’re just concerned with pronunciation. Sometimes, it would be really convenient to unambiguously write down how a word’s pronounced. For instance, what are dictionary makers supposed to do with all these letters that work too many jobs? Most dictionaries have established their own guidelines for how they’ll represent pronunciations, and the whole mess is a lot easier now when we can go online, push a button, and hear a sound clip. Things weren’t so easy back at the dawn of linguistics. There were no conventions and no sound recordings, so the 19th-century pioneers of phonology had to make up their own rules for documenting speech. And boy, did they ever. Often individually. Then, in the 1880s, some teachers got together to establish a standard international alphabet for teaching phonetics. (Teaching phonetics is what Henry Higgins does in My Fair Lady. Like other fields in linguistics, modern phonetics is much less concerned with telling people what to do and much more concerned with observing what they do already. This is sounding familiar. Have we harped on this before?) The International Phonetic Association and its masterwork, the International Phonetic Alphabet, were born. I know, right? I get goosebumps, too. Some of you may be asking the obvious question: But why, though? Dictionaries get along just fine appropriating various symbols to show simple pronunciations, and why do you need a notation that can transcribe any language when most languages already have their own writing system? Shouldn’t they just write down pronunciations in their own way? Well first, universal systems are incredibly useful and important for scholarship. Just like math or physics, the principles of linguistics are the same no matter where you are or what you’re analyzing. Can you imagine how slow and inconvenient it would be if you had to learn two different ways to write numbers for algebra and geometry? Like, in algebra you write “3,” but in geometry three is always written as “@.” That would be silly. With IPA, linguists have a consistent way to discuss the sound systems of every language. We can even look at languages we don’t speak. I might not know cyrillic, but I can still read scholarly articles about the pronunciation of Russian because I have IPA. Second, the proprietary methods many dictionaries adopt for noting pronunciation lack precision. It’s all well and good to say we’re going to use E for e as in pen, but I can tell you right now, different dialects of English pronounce the vowel in that word very differently. Dictionary codes like this are useful, but in a limited way. Linguists have established unambiguous ways of defining which sounds they mean regardless of accent or language. You may have noticed the symbols on the IPA chart are organized into tables and diagrams. Each sound, and each corresponding symbol, is carefully defined by the position of the mouth and the actions of the vocal cords and lungs at the time of production, among other features.1 Even when studying sounds their own language doesn’t have or sounds they themselves have trouble producing, a linguist can know exactly what they’re dealing with. Third, documentation alone isn’t enough, either written or recorded. Even with high quality sound recordings that allow us to preserve and revisit utterances and language varieties as much as our little hearts desire, IPA is still a useful, regularly used tool. It enables layers of analysis from the basic, underlying target pronunciation of a word to detailed transcriptions of exactly how a word was produced by a specific speaker a specific time they uttered it. Furthermore, a notation like IPA facilitates written scholarship. Imagine how cumbersome it would be if every article and book about phonetics had to include a CD or a collection of sound files because there was no convenient way for the author to write down their findings. All this talk of anatomy and utterances and transcription is getting closer to what phonologists and phoneticians actually do. I’ll be back in a few weeks to start you on a crash course in Phonology 101. I promise all those made-up-looking words on the IPA chart actually serve a purpose. All in all, IPA is pretty invaluable to linguists. Our jobs would be a lot harder and our field couldn’t have come so far without it. But we’re not selfish about it. Us linguists, we like to share. Many singers and choral directors find IPA useful, too. You can see the benefit to everyone in a large choir pronouncing the words they’re singing the same way—the music’s prettier that way! For the casual user, IPA can be a helpful thing to know when you’re learning how to pronounce another language. Yes, maybe I’m biased, but I just want to wrap the IPA up and hand it out to everyone I meet: linguists’ gift to the world. I mean, you’re welcome. No? Oh, okay. Next week, Riccardo will be back to talk about types of languages. 1As a point of interest, the blank spots in the pulmonic consonants table are sounds that are unattested in the known languages of the world. The greyed out areas are sounds that are thought to be unproducible.